Phomopsis vexans is an important fungal plant pathogen associated with brinjal. Since its discovery from 1893, it has undergone several taxonomic changes to its current nomenclature P. vexans in 1914. Several mycologists have contributed immensely to the understanding of the diversity, biology and pathological aspects of P. vexans and to the extent to which it causes damage to the brinjal crop production. At present, P. vexans is widely distributed in all major brinjal growing regions of the world. It causes damping-off of seedlings in nursery, leaf blight; fruit rot and stem blight at various stages of plant growth and development. It produces two types of conidia such as alpha and beta; alpha conidia are hyaline, biguttulate, oval and infective and beta conidia are the diagnostic feature of the genus Phomopsis. The fungal pathogen is known to survive in soil, seed and disseminated through rain splash. Though various chemical and biological management methods have been adapted to reduce the disease incidence, P. vexans is still a major challenge for the plant pathologists around the globe. Search for various sources of resistance against P. vexans is an on-going program in many research institutes met with little success. The present management system focuses on the application of bio-control agents to check the disease development and to confer resistance against P. vexans. Solanum melongena, Diaporthe vexans, Molecular phylogenetic relationship, Host resistance, Phomopsis vexans. Phomopsis vexans is an anamorphic stage of Diaporthe vexans on brinjal causing severe crop loss in brinjal in different parts of the world. The fungus is seed-borne and produces a large number of alpha conidia which causes infection and subsequent disease development in brinjal, its only significant host [1-3]. The infection results in manifestations of many symptoms ranges from poor seed germination, damping-off of seedlings to the most prominent symptoms such as leaf blight, stem blight and fruit rot. It generally infects foliage, stem and the fruits [4-6]. In field conditions, P. vexans infection produces small circular spots which later become grey to brown with irregular blackish margins. When favourable conditions prevail, the necrotic spots enlarge and number of spots increases. Lesions developed on petiole and stem, causes blight on affected plant parts. Infected fruits show diverse symptoms such as fruit rot, soft rot and mummification. Initially, the symptoms appear as minute, sunken dull and dusky spots which later merge to form rotten areas. The edible portion of the fruit rots progressively and pycnidia arise on affected tissues. They are erumpent, brown to black 60-200 μm in diameter. On the leaves, pycnidia measures 120-350 μm in diameter and globose to irregular in shape. Conidiophores (phialides) within the pycnidium are septate and 10-16 μm long. Pycnidiospores (conidia) are hyaline, one celled, sub cylindrical and 5-9 × 2-2.8 μm in diameter. In most of the tropical and subtropical areas, leaf blight and fruit rot is considered to be a serious disease. The disease initially starts as foliar blight and most destructive phase of the disease is noticed when fruit start rotting which results in heavy crop loss both in the field as well as during transit. Species of Diaporthe and its asexual state (Phomopsis) have broad host range and are widely distributed on plants as saprobes, parasites and endophytes [7-12]. Diaporthe spp. are also responsible for some of the most important diseases on crop plants worldwide. The disease includes root rot, fruit rot, dieback, canker, leaf spot, leaf blight, decay and wilt [13-15]. In the past, Diaporthe species association with plants have been noted to deter herbivory, lingo-cellulolytic activities, or as bio-herbicides. The anamorphic stage of P. vexans, has been reported from many areas in the warmer parts of most continents, but is unknown in Romania and known only in few African countries. It is probably native to southern Asia, the area of origin of the host Solanum melongena (eggplant/aubergine), where it is also reported to infect some wild Solanum species [16-18]. In India, the pathogen has been reported from all major brinjal growing states such as Karnataka, Tamilnadu, Andra Pradesh, Kerala, Goa, West Bengal, Maharashtra, Madhya Pradesh, Assam, Himachal Pradesh, Uttar Pradesh and Gujarat [19-23]. The disease is reported to cause 15-20% (30-50% in severe case) yield loss estimated equivalent to 30.84 US $ per annum . Recent quantification disease prevalence across six agro-ecological regions and its severity reminds for the need for accurate disease prediction and development of better management strategies [25,26]. Seed borne incidence of P. vexans is also one of the major limiting factors for eggplant cultivation. However, eggplant cultivars grown in Bangladesh showed a wide range of variations in yield performance and disease reactions. Most of the cultivars are reported to be susceptible to this disease. Several workers have estimated the seed borne incidence varied from 10-20% in dried and freshly harvested seeds of brinjal [6,27,28]. In India, the disease incidence ranges of 10-40%. The exact statistical data on exact disease incidence and severity is not available. P. vexans is always considered as host specific, but later studies indicated that, Capsicum annuum and Solanum lycopersicum are also reported as its potential hosts [10-12,29,30]. Others include Acacia arcuaefolia, Prunus armeniaca (apricot), seeds of Sorghum bicolor  and Capsicum frutescens respectively [31-33]. In India, it is reported to infect wild Solanum incanum upon artificial inoculation [13,18]. Pawar and Patel reported the similar results for tomato, pepper and potato, as well as on Solanum nigrum . However, Edgerton and Moreland failed to get infection on tomato, pepper, potato and on wild Solanum species. These reports did not specify the plant parts inoculated, but uninjured tomato and pepper fruits are found to be unaffected by the fungus in parallel trials with brinjal in India [10,34]. Diaporthe vexans (Sacc. & Syd.) Gratz 1942 (Syn=P. vexans); Phomopsis vexans (Sacc. & Syd.) Harter. 1914; Ascochyta hortorum (Speg.) C.O. Sm. 1905; Phoma solani Halst. 1892. Phoma vexans Sacc. & Syd. 1899 and Phyllosticta hortorum Speg. 1881. It was Spegazzini first described the fungus associated with leaf blight and fruit rot disease of eggplant as Phyllosticta hortorum in 1881. The existence of several pycnidial fungi causing leaf spot on brinjal resulted in difficulties with the identification of each one. Spegazzini  described a fungus occurring on leaves of S. melongena in Italy as Phyllosticta hortorum. Pathologists attributed the leaf blight and fruit rot disease to Phyllosticta hortorum Speg . Occurring in the regions of USA and certain parts of Europe. Halsted described the same fungus on leaves and fruits of eggplant in New Jersey (USA) as Phoma solani. Since, the name P. solani has been already been given by Cooke and Harkness to another fungus on another host, Saccardo and Sydow substituted Phoma vexans [36,37]. Smith et al. observed the occurrence of bi-celled pycniospores (conidia or pycnidiospores) and placed them under Ascochyta hortorum (Speg.). Voglino studied the fungus on aubergine and agreed with Smith and concluded that the fungus described by Spegazzini as P. hortorum and Phoma solani and Phyllosticta hortorum have been considered as the same species [38,39]. Detailed observations made by Harter , concluded that the taxons such as P. hortorum, Phoma solani, Ascochyta hortorum were infact the same fungus by cross-inoculation and morphological studies and concluded that the genus to which the fungus belonged was not Phoma, Phyllosticta or Ascochyta, but Phomopsis . Harter also observed and described the beta conidia (stylospores) which are characteristic feature to the genus Phomopsis and proposed the name Phomopsis vexans and was universally accepted for isolates which were different from P. hortorum . Phomopsis vexans produces both alpha and beta conidia which are true to the genus Phomopsis [41,42]. The teleomorph of P. vexans has not yet been encountered in nature except Gratz, who observed the perithecial fruiting bodies on 2% potato dextrose agar and assigned the name Diaporthe vexans . However, the current view on D. vexans as the teleomorph of P. vexans  has been considered as illegitimate and P. vexans is now considered to apply only to the anamorph [44,45]. It is also reasoned that, though, D. vexans is supposed to be a teleomorph name, it is only valid as anamorph combination as there is no Latin diagnosis (Art. 59, ICBN) . Mycological studies of P. vexans on agar medium revealed that, the fungus produces whitish septate, hyaline mycelium with wavy margins at the periphery. The fungus produces pycnidia all over the agar surface and the size of pycnidia varies from isolate to isolate and from region to region [46,47]. Two distinct colony types among Phomopsis species have been recognized; W and G type where G-type colony characterized by a few white to grey aerial hyphae, abundant small pycnidial stromata with irregular pycnidial locules and W-type colony with aerial hyphae, scattered relatively large stromata, irregular pycnidial locules with alpha and beta conidia [48,49]. Conidiomata pycnidial, sub-epidermal, erumpent, dark, thick-walled, flattened to globose, size varies from 100-300 μm, with or without a break. Beak measures up to 76-85 μm. Phialides hyaline, simple to branched, sometimes septate, 10-16 μm long, arise from the innermost layer of cells lining the cavity. The conidiophores (phialides) within the pycnidium are hyaline, simple or branched, sometimes septate and arise from the innermost layer of cells lining the pycnidial cavity. Conidia are hyaline, one celled and sub cylindrical which gradually changed to beta type. Formation of conidia within the pycnidium is temperature dependent. Alpha conidia hyaline, aseptate, sub-cylindrical, 5-8 × 2-3 μm. Beta conidia filiform, curved hyaline, septate, 18-32 × 0.5-2.0 μm and was non-germinating in nature. But inoculation of host with beta conidia caused interveinal necrosis. Hyphae hyaline, septate measured 2.5-4.0 μm diameter [10,12,15,21,50-52]. 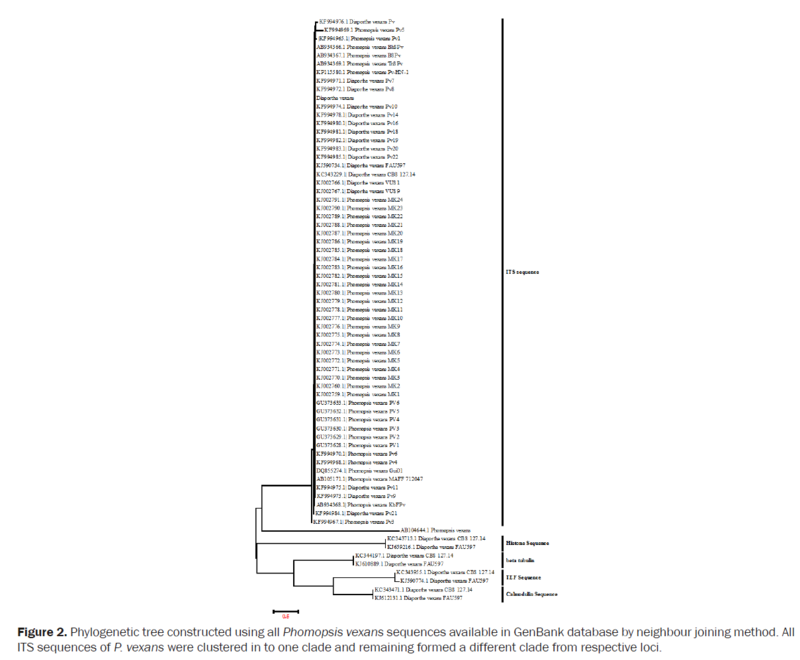 Existence of morpho-cultural variability among the P. vexans has been studied [47,51-53]. However, such variations among isolates may be attributed to the functional relatedness among the environmental factors but such variations cannot be interpreted by genetic means [52-56]. All the isolates exhibit overlap and 100% similarity with respect to the genetic relatedness inferred by ITS phylogenetic analysis. The development of symptoms on the young seedlings exhibited girdling signs at the basal region of the stem and the soil surface [57,58]. Such seedlings soon topple and die due to loss of viable root system. Appearance of pycnidia near the girdled region is common and the whole seedlings collapse and die. Foliage come in contact with the contaminated soil surface may become infected directly through conidia . On the leaves, the pathogen causes necrotic zone in early stage of crop development. The leaf spot which appear typically round, brown, oval later became irregular in shape. Lesions on the petiole and on the lower part of the midrib results in necrosis. Affected leaves may drop prematurely, and the blight affected areas may cover with numerous black pycnidia [6,15,25,27,40] (Figure 1). Figure 1: Phomopsis vexans leaf blight and fruit symptoms on of brinjal: A- Typical leaf blight; B- Fruit rot symptom; C- Stem blight symptom; D- Pycnidia under Stereo binocular microscope; E- P. vexans on Potato Dextrose Agar medium; F- Alpha and Beta conidia under compound microscope. On stem and aerial branches, elongated black-brown lesions with irregular shape are formed showing many pycnidia. The disease affected plants bear small leaves and the axillary buds are often reduced or killed. When stem girdling occurs, the shoot above the infected area wilts and dries up and the plant may be toppled [10-12]. Pycnidia generally develop on lesions on produced on young stems, but rarely on older stems . On fruit, the symptoms appear first as minute sunken grayish spots with a brownish halo which later enlarge and coalesce to produce concentric rings of yellow and brown circles. These area increases in size and form large rotten areas on which conidiomata often develop concentrically, covering the rotten fruit surface. Pycnidia on fruit are larger than those produced on stem and leaves . If the infection occurs on fruits through the calyx, the whole fruit may become mummified . Initially the lesions are small, more or less circular, and buff to olive, later becoming cinnamon buff, with an irregular blackish margin. Rot may appear in fruit, in transit after harvest . Seed infection results in poor germination and seedling blight to fruit rot. Post-emergence damping-off of seedlings results from infection of the stem just above the soil surface. The symptoms on leaves are more prominent during the early stages of plant growth [11,19,59-65]. The molecular tools such as PCR have assisted the accurate diagnosis of P. vexans. Jayaramaiah et al. attempted to study the molecular detection of the pathogen using universal specific primers . PCR based variable number of tandem repeats (VNTR) have been used to characterize the P. vexans isolates from Bangladesh  using MR-20 primers. VNTR analysis helps to classify the isolates based on morphological and molecular characteristics and assist in differentiating the intra-specific variations . Other molecular techniques like RAPD and RFLP markers are able to differentiate among taxa within the Diaporthe/Phomopsis complex, as well as among isolates within D. phaseolorum var. caulivora, D. phaseolorum var. caulivora, and D. phaseolorum var. mariodionalis isolates [66,67]. There are about 58 P. vexans sequences available in GenBank database, of which 52 sequences are from Indian subcontinent and rest of the sequences were from CBS Culture Collection Centre Netherland. They were able to detect the inoculum from different sources by visualizing the amplification of desired length of ITS-rDNA. Though the pathogen P. vexans is globally important, application of molecular tools to study the host-pathogen interactions are very few. Phomopsis species have often been recognized as host specific but the recent molecular analysis revealed that pathogen might have changed their host specificity or they might have jumped from one host to an another . The ITS sequence of P. vexans retrieved from GenBank and their phylogenetic analysis by neighbour joining [68,69] method revealed that all the ITS sequence shared a common clade and other loci are placed in a distinct clade separated from ITS (Figure 2). Figure 2: Phylogenetic tree constructed using all Phomopsis vexans sequences available in GenBank database by neighbour joining method. All ITS sequences of P. vexans were clustered in to one clade and remaining formed a different clade from respective loci. Chemical based as well as bio-agent based formulations have been used to manage the disease caused by P. vexans . The systemic fungicides such as Bavistin (0.1%), Vitavax (0.1%), Blitox-50 (0.2%), and Ridomil (0.15%) proved to be the most effective in inhibiting the growth of P. vexans in-vitro as well as in field conditions. Nimbidine proved to be effective, but slightly less effective than systemic fungicides. Nimbidine being a safe and eco-friendly bio-product has been used in the management of the disease . Seeds treated with Carbendazim (0.2%) or Thiophenate methyl (0.2%) produced excellent results . With the initiation of the disease, foliar spray with Carbendazim (0.1%) or combination of Mancozeb (0.25%) and Carbendazim (0.05%) or Copper oxychloride (0.3%) and repeat at 10 to 14 days intervals gave good results. Besides, cultural practices such as collection and destruction of the diseased plant debris, crop rotation and use of pathogen free seeds are very useful in reducing the disease incidence [71-74]. Seed treatments with fungicides at different concentrations (0.05, 0.10, 0.15 and 0.20 %) reduced the seed mycoflora. The systemic fungicides namely Carbendazim and Carboxin, non-systemic fungicides such as Mancozeb, Captaf and Dithane Z-78 are also effective. Among the fungicides evaluated, Mancozeb, Carbendazim and Captaf are found superior in reducing the seed-borne inoculums and improving seed germination at 0.2% concentration [27,71,73]. Applications of various fungicides such as Vitavax and Blitox-50 offered considerable protection to against P. vexans [75,76]. Among the bio-control agents studied, Trichoderma virens, T. harzianum and T. viride are found effective in antagonizing the mycelial growth of P. vexans on in-vitro . Antimicrobial action of Bacillus subtilis, Streptmyces griseus, and fungal species such as Aspergillus, Penicillium, Trichoderma, Periconia have been tested against Phomopsis vexans . Trichoderma harzianum and Bacillus subtilis were also found to be effective. Antagonistic Pseudomonas fluorescens and Trichoderma harzianum seed treatment and foliar applications have been found to be effective against P. vexans [65,78]. Since 2001, existence of varietal reaction of eggplant cultivars to P. vexans has been investigated [71-73,79-84]. The application of fungicides in combination with micronutrients showed better performance in reducing disease incidence and disease severity. Bavistin 50 WP (0.1%) alone or in combination with micronutrients (Gypsum, ZnO and Boric acid) has been suggested for management of blight and fruit rot of eggplant [85-87]. Recent studies on the application of Garlic bulb and Allamanda leaf extracts reduced field incidence of blight and fruit rot by 66% and 75% respectively . Panda et al. also reported the application of Allamanda leaf extract as a potential fungicide for the Phomopsis management . Recent studies have shown that pyraclostrobin could be used treat the seeds which helps plants to produce more defense enzymes . Species of Diaporthe and its anamorphic stage Phomopsis have broad host range and are widely distributed as plant parasites on crop plants worldwide. The disease includes root rot and fruit rot, dieback, canker, leaf spot, blight, decay and wilt are the important ones. Phomopsis vexans is a major constraint for crop production. This necessitated the search for alternative durable resistance in wild and cultivated varieties of brinjal. Modern day agriculture embraces multifactor approach for disease management to get positive results. Brinjal shows a great diversity due to their large number of varieties, cultivars, landraces, hybrids, advanced lines, and wild races available in most of the Asiatic region. Though India is bestowed with various wild germplasm of brinjal, no attempt has been made to screen them for disease resistance against Phomopsis blight and fruit rot. Though the crop is cultivated in many Asian countries, studies have not been made to harness the genetic potentiality of the crop in diverse ecological regions. Genetic information regarding disease susceptibility and characteristics that contribute to yield must be examined to improve eggplant crop production. For rapid and efficient plant breeding programs, knowledge of the interrelationships among disease susceptibility and factors affecting yield are necessary. The qualitative and quantitative improvement of crops depends on the available gene pool and its manipulation. Genetic diversity studies based on morphological traits and molecular marker studies enable the evaluation of genetic variation prior to the initiation of a new breeding program. Development of SCAR markers for selection of elite varieties through breeding program needs to accelerate to reach the expected goals. Integration of molecular tools and techniques to develop new advanced varieties is the need of the hour. Though, the area under brinjal cultivation is declining at global level, still there is lot of scope for the brinjal crop in all major Asian countries as it constitutes one of the major vegetable crops. In recent times, we have seen the decline in productive land under brinjal cultivation with reduced productivity per unit area followed by association of various biotic and abiotic factors which cause severe damage to the overall production remained a major concern. Pathogenesis related proteins (PRP’s) are playing an important role in conferring resistance and inhibiting the development of the fungal pathogen during the early stages of pathogenesis. Several PRP’s are well recognized proteases which play an important role in degrading the pathogen cellular components. The events of pathogenesis during Brinjal-Phomopsis host pathogen interaction need to be addressed to understand the role of pathogenesis related proteins and their expression patterns in susceptible and resistant cultivars. Several biotic inducers such as T. harzianum, P. fluorescence and abiotic inducers like salicylic acid, glutamic acid played an important role in inducing disease resistance by activating the PRP’s and their regulatory genes. Considering the immense application of PR genes in disease resistance, there is an ample scope for exploiting the PRP’s expressed during disease development in brinjal and P. vexans system. Recent molecular biology tools and techniques have given us a wide opportunity to unravel the genome organizations of life firms. So far, whole genome sequences of several solanaceous crops are available in database and it is also useful to have the whole genome sequence of P. vexans to understand its biology in the language of sequences and their bioinformatics applications. The first author (Mahadevakumar S) would like to thank Department of Science and Technology, New Delhi for providing financial assistance in the form of INSPIRE Fellowship (No. IF110422). Edgerton CW and Moreland CC. Eggplant blight. Louisiana Agricultural Experiment Station Bulletin. 1921;78:1-44. Pawar VH and Patel MK. Phomopsis blight and fruit rot ofbrinjal. Indian Phytopathology.1970;10: 115-120. Sherf AF and McNab AA. Vegetable diseases and their control. (2ndedn). John Wiley and Sons, New York, USA. 1986. Dubey RC, et al. Stem blight and fruit rot of Solanumincanum caused by Phomopsis vexans - a new record. Proceedings of the Indian Academy of Science Section B. 1987;57:197-198. Rangaswamy G and Mahadevan A. Diseases of Crop Plants in India. (4thedtn), PHI Learning Pvt. Ltd., New Delhi. 1998. Jayaramaiah KM, et al. PCR based detection of Phomopsis vexans (Sacc. &Syd.) The causative agent of leaf blight and fruit rot disease of Brinjal (Solanum melongena L.). International Journal of Life Science. 2013;7:17-20. Carroll GC. The biology of endophytism in plants with particular reference to woody perennials. In: Fokkema NJ and van den HJ (Eds). Microbiology of the phyllosphere. Cambridge University Press, Cambridge. 1986. Boddy L and Griffith GS. Role of endophytes and latent invasion in the development of decay communities in sapwood of angiospermous trees. Sydowia. 1989;41:41-73. Udayanga D, et al. The genus Phomopsis: biology, applications, species concepts, and names of common phytopathogens. Fungal Diversity. 2011;50:189-225. Murali TS, et al.EndophyticPhomopsis species: host range and implications for diversity estimates. Canadian Journal of Microbiology. 2006;52:673-680. Botella L and Diez JJ. Phylogenic diversity of fungal endophytes in Spanish stands of Pinushalepensis. Fungal Diversity. 2011;47:9-18. Gomes RR, et al.Diaporthe: a genus of endophytic, saprobic, and plant pathogenic fungi. Persoonia. 2013;31:1-41. Mostert L, et al. Species of Phomopsis and a Libertella sp. occurring on grapevines with specific reference to South Africa: morphological, cultural, molecular and pathological characterization. Mycologia. 2001;93:146-167. Santos JM, et al. Resolving the Diaporthe species occurring on soybean in Croatia. Persoonia. 2011;27:9-19. Thompson SM, et al. Stem cankers on sunflower (Helianthus annuus) in Australia reveal a complex of pathogenic Diaporthe (Phomopsis) species. Persoonia. 2011;27:80-89. Smith IM, et al. European handbook of plant diseases. Blackwell Scientific Publications, Oxford, UK. 1988. Prance G and Nesbitt M. The cultural history of plants in New York. Routledge Press, New York, USA 2005. Datar VV and Ashtaputre JU. Studies on resistance to Phomopsis fruit rot in eggplant. Indian Phytopathology. 1988;41:637-638. Panwar NS, et al.Phomopsis fruit rot of brinjal (Solanum melongena L.) in Punjab. I. Variability of fungus and role of seed in disease development. Ludhiana Journal of Agriculture. 1970;7:641-643. Lawande KE and Chavan JK. Eggplant (Brinjal). In: Salunke DK and Kadam SS (Eds). Handbook of Vegetable Science and Technology. Production Technologies and Storage Processing, New York. 1998. Akhtar J and Chaube HS. Studies on Phomoposis blight of brinjal with special reference to variability in Phomopsis vexans, the incitant of the disease. Journal of Mycology and Plant Pathology. 2003;33:465. Muneeshwar S, et al. Occurrence of Phomopsis leaf blight and fruit rot of brinjal caused by Phomopsis vexans in Jammu. Annals of Plant Protection Sciences. 2011;19:396-399. Das SN and Sarma TC. Some micro-fungi and their association on the incidence of diseases of brinjal (Solanum melongena L.) in Western Assam. The Bioscan. 2012;1:303-306. Sharmin D, et al. Inheritance of resistance to Phomopsis blight and fruit rot in brinjal. Journal of Agro Forestry and Environment. 2010;3:135-140. Mahadevakumar S and Janardhana GR. Leaf blight and fruit rot disease of brinjal caused by Diaporthevexans (Phomopsis vexans) in six agro-ecological regions of Southwest India. Plant Pathology and Quarantine.2016;6:5-12. Mahadevakumar S andJanardhana GR. Effect of Pyraclostrobin on induction of pathogenesis related proteins in brinjal (Solanum melongena L.) against Phomopsis vexans. International Journal of Agriculture Sciences.2016;8:1080-1082. Thippeswamy B, et al. Location and transmission of Phomopsis vexans, Alternariasolani in brinjal. Indian Phytopathology. 2005;58:410-413. Jayaramaiah KM andJanardhana GR. Mycobiota and their relative Percent incidence on freshly harvested Brinjal seeds produced in Karnataka. Asian Journal of Microbiology, Biotechnology and Environmental Science.2011;13:281-283. Imazeki R, et al. Descriptive catalogue of Taiwan (Formosan) fungi, Part XI. College of Agriculture, Taiwan University, Taiwan. 1959. Tai FL. SyllogeFungorumSinicorum. Science Press, Academia Sinica, Peking China.1979. Mathur RS. The Coelomycetes of India. Bishen Singh Mahendra Pal Singh Dehradun, India. 1979. Dal Bello G and Sisterna M. First report of Phomopsis vexans on apricot in the Americas. Plant Disease. 2000;84:596. Cho WD and Shin HD. List of plant diseases in Korea. Fourth edition. Seoul. Republic of Korea, Korean Society of Plant Pathology. 2004. Chaudhary SR and Hasija SK. Phytopathological studies on Phomopsis vexans causing soft rot of brinjal fruits. Indian Phytopathology. 1980;32:495-496. Spegazzini C. Nova addend an ad mycologiam. Venetam. Atti Soc CrittogItal Ann. 1881;24:42-71. Halsted BD. Some fungous diseases of the eggplant. New Jersey Agricultural Experiment Station Twelfth Annual Report.1892;277-283. Saccardo and Sydow.Phomavexans. Saccardo Syll. Fungi. 1899;14:889. Smith CO. Study of the diseases of some truck crops of Delaware. Delaware Agricultural Experiment Station Bulletin. 1905;70:16. Voglino P. Intorno ad. un parassita dannoco al Solanum melongena. Malpighia. 1907;21:353-363. Harter LL. Fruit-rot, leaf-spot and stem blight of the eggplant caused by Phomopsis vexans. Journal of Agricultural Research.1914;2:331-338. Uecker FA. A World List of Phomopsis Names with notes on Nomenclature, Morphology and Biology. Mycologia Memoir, No. 13. Cramer Publisher, Berlin, Germany 1988. Boerema GH, et al. Phoma identification manual Differentiation of specific and infra-specific taxa in culture. CABI Publishing, Wallingford, UK 2004. Gratz LO. The perfect stage of Phomopsis vexans. Phytopathology. 1942;32:540-542. Rehner SA and Uecker FA. Nuclear ribosomal internal transcribed spacer phylogeny and host diversity in the CoelomycetePhomopsis. Canadian Journal of Botany. 1994;72:1666-1674. Punithalingam E and Holliday P. Phomopsis vexans. Descriptions of Fungi and Bacteria. IMI Descriptions of Fungi and Bacteria, No. 34. CAB International, Wallingford, UK. Divinagracia GC. Some factors affecting pycnidial production of Phomopsis vexans in culture. Philippines Journal of Agriculture.1969;53:173. Panwar NS and Chand JN. Cultural characters and pathogenicity of three isolates of Phomopsis vexans (Sacc&Syd.) Harter. Indian Journal of Microbiology.1968;8:203-205. Kanematsu S, et al. Conidial morphology, pathogenecity, and culture characteristics of Phomopsis isolates from peach, Japanese pear and apple in Japan. Annals of Phytopathological Society of Japan. 1999;65:264-273. Kanematsu S, et al.Molecular phylogenetic analysis of ribosomal DNA internal transcribed spacer regions and comparison of fertility in Phomopsis isolates from fruit trees. J Gen Plant Pathol. 2000;66:191-201. Singh RS. Plant Pathogens. (2ndedn) Oxford and IBH Publishing Company, New Delhi, Indi. 1987. Akhtar J. Variability in production, inter conversion and germinability of α and β conidia in Phomopsis vexans. Journal of Mycology and Plant Pathology. 2006;36:193-197. Akhtar J. Molecular Characterization of Phomopsis vexansInciting Phomopsis Blight and Fruit-rot of Eggplant. Journal of Mycology and Plant Pathology. 2009;39:39-41. Islam SJ and Pan S. Variabilities among isolates of Phomopsis vexans. Environmental Ecology.1990;8:315-319. Islam SJ and Pan S. Functional relationship of Phomopsis leaf blight of eggplant with environmental factors and a linear model for predicting the disease. Indian Phytopathology.1992;45:199-202. Islam MM, et al. Morphological characterization of Phomopsis vexans isolates of Bangladesh. Journal of Science Foundation. 2013;8:123-130. Islam MM, et al. Molecular characterization of isolates of Phomopsis vexans eggplant of Bangladesh. Journal of Science Foundation. 2010;8:131-140. Kaushal N and Sugha SK. Role of Phomopsis vexans in damping off of seedlings in eggplant and its control. Indian Journal of Mycology and Plant Pathology. 1995;25:189-191. Divinagracia GC.Pycnidial production by Diaporthevexans (Sacc&Syd.) Gratz. and the pathological history of infected stem and leaves of eggplant. Plant Disease.1968;29:836-837. Porter RP. Seed-borne inoculum of Phomopsis vexans - its extent and effects. Plant Disease Reporter. 1943;27:167-169. Karuna V and Sanjay K. Detection and transmission of seed borne inoculum of Phomopsis vexans (Sacc. &Syd.) Harter. and the effect of infection on seed quality in egg plant (Solanum melongena L.). Seed Research. 1993;21:66-71. Karuna V. Location of infection of Phomopsis vexansin brinjal seed. Indian Journal of Mycology and Plant Pathology.1994;24:226. Vishunavat K and Kumar S. Location of infection of Phomopsis vexans in brinjal seeds. Indian Journal of Mycology and Plant Pathology. 1994;24:226. Pan S and Acharya S. Studies on the seed borne nature of Phomopsis vexans(Sacc. and Syd) Harter. Indian Agriculturist. 1995;39:193-198. Mathur SB and Kongsdal O. Common Laboratory Seed Health Testing Method for Detecting Fungi. (1stedn). International Seed Testing Association, Bassersdorf, Switzerland. 2003. Srinivasa C, et al. Effect of bio-agents and fungicides against Phomopsis vexans and on seed quality of brinjal. Crop Improvement. 2005;32:95-101. Fernandez FA and Hanlin RT. Morphological and RAPD analysis of Diaporthe phaseolorum from soybean. Mycologia. 1996;88:425-440. Zhang AW, et al. Molecular identification and phylogenetic grouping of Diaporthe phaseolorum and Phomopsislongicola isolates from soybean. Phytopathology. 1998; 88:1306-131. Larkin MA, et al. Bioinformatics. 2007;23:2947-2948. Tamura K, et al. MEGA5: Molecular Evolutionary Genetics Analysis using Maximum Likelihood, Evolutionary Distance, and Maximum Parsimony Methods.Molecular Biology and Evolution 2011;28: 2731-2739. Singh R, et al.Management of Phomopsis leaf blight of brinjal through different fungicides and bio-pesticides. Hort Flora Research Spectrum. 2012;1:371-374. Singh AK and Agarwal KC. Fungicidal control of Phomopsis fruit rot of brinjal. Vegetable Science. 1999;26:192. Singh D and Chakrabarti AK. Chemical control of Phomopsis fruit rot of brinjal. Indian Phytopathology. 1982;35:314-315. Kumar S and Sugha SK. Sensitivity of different strains of Phomopsis vexans to selected fungicides. Journal of Mycology and Plant Pathology. 2004;34:100-101. Rohini, et al. Evaluation of efficacy of fungicides against Phomopsis leaf blight of brinjal (Solanum melongena L). International Journal of Agricultural Science and Research.2015;5(6):45-50. Pani BK, et al. Chemical Control and Economics of Phomopsis Blight and Fruit Rot of Brinjal in the Eastern Ghat Highland Zone of Odisha. International Journal of Agriculture, Environment & Biotechnology. 2013;6:581. Muneeshwar S, et al. In Vitro evaluation of fungicides and biocontrol agents against Brinjal leaf blight and fruit rot pathogen Phomopsis vexans (Sacc. &Syd.) Harter. Bioinfolet. 2012;9:327-332. Varma RK and Bhale MS. Microorganisms for the management of Phomopsis blight and fruit rot of eggplant caused by Phomopsis vexans (Sacc. &Syd.) Harter. Journal of Mycopathological Research. 2010;48:245-249. Das SN and et al. In vitro evaluation of fungicides and two species of Trichoderma against Phomopsis vexans causing fruit rot of brinjal (Solanum melongena L.). International Journal of Scientific and Research Publications. 2014;4:1-3. Kalda TS, et al. Studies on resistance to Phomopsis blight in eggplant (Solanum melongena L.). Vegetable Science. 1976;3:65-70. Ren X and Zhang H. Test on brinjal (Solanum melongena L.) resisting to Phomopsis rot. Journal of Jilin Agricultural University. 1993;15:34-39. Mohanty AK, et al. Efficacy of certain fungicides in controlling Phomopsis vexans causing fruit rot of brinjal. Orissa Journal of Agricultural Research. 1994;7:85-86. Das SR (1995) Bio-efficacy and economics of fungicidal control of Phomopsis leaf blight/fruit rot of brinjal in Orissa. Orissa Journal of Horticulture 23(1/2): 9-12. Pandey KK, et al. Phomopsis blight in brinjal and sources of resistance. Indian Phytopathology. 2002;55:507-509. Khalil MI, Meah MB, Islam MM Morphological and molecular characterization of eggplant lines for resistant to Phomopsis blight and fruit rot. International Journal of Agricultural Research Innovation and Technology. 2013;3:35-46. Sugha SK and Kumar S. Effect of fertilizers on Phomopsis blight disease (Phomopsis vexans) of brinjal (Solanum melongena). Indian Journal of Agricultural Sciences.2003;73:32-34. Hossain MI, et al. Control of Phomopsis blight of eggplant though fertilizer and fungicide management. International Journal of Agricultural Research Innovation and Technology. 2013;3:66-72. Mohanty AK et al. Efficacy of crude plant extracts of some selected plants in controlling brinjal blight and fruit rot pathogen, Phomopsis vexans. Crop Research.1995;9:447-448. Panda RN, et al. Antifungal efficacy of homeopathic drugs and leaf extracts in brinjal. Environment and Ecology. 1996;14:292-294.